Hey, everyone! 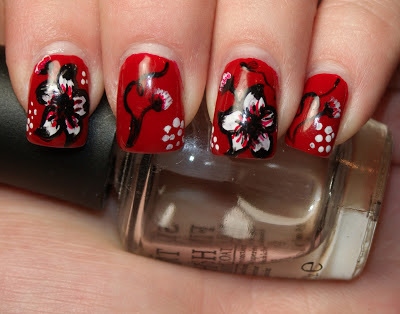 I'm kicking off the work week with a little bit of nail art in this short, but sweet post. It's what I wore for most of my first week of work at the end of last month. I wanted to wear red and this just kind of snowballed from there! For the base, I used OPI Big Apple Red. I tried a little something different with the flowers, more on the artsy and abstract side. What do you think? The big flowers are my favorite! Love that you went simple with three colors. It's so romantic! Love! You did a beautiful job on these! !